Depending on disease manifestations, cultures of pharyngeal secretions, blood, cerebrospinal fluid, joint aspirate, leading edge aspirate of cellulitis, skin biopsy specimen, epiglottic secretions, bronchoalveolar lavage fluid, thoracocentesis fluid, or abscess fluid may be sources for locating the organism. In cases of suspected necrotizing fasciitis, a frozen section biopsy obtained in the operating room may be of great value in confirming the diagnosis and may aid in defining how much surgical débridement of devitalized tissue is necessary. Serologic assays (antistreptococcal antibodies) are a potentially useful adjunct for diagnosis. Other ancillary laboratory tests—eg, complete blood count (CBC), white blood cell (WBC) count, erythrocyte sedimentation rate, and C-reactive protein—may also be useful, depending on the manifestations of disease under consideration. Other tests, depending on disease syndrome, can be very diverse in nature. For example, a histopathologic analysis of skin biopsy specimens, which may need to be analyzed intraoperatively, is warranted in cases of suspected necrotizing fasciitis. Calculation of creatinine clearance may be valuable in assessing the extent of renal dysfunction for nephritis. Because pharyngitis and tonsillitis may result from various infectious etiologies other than S pyogenes infection, the diagnosis should be confirmed. Throat culture remains the criterion standard diagnostic test for streptococcal pharyngitis. Although some throat culture results are false-positive (eg, they do not reflect acute infection but, rather, symptomatic carriage), all patients with positive culture results are treated with antibiotics. GAS grow readily on routine media, but they can be isolated more easily using selective media that inhibit the growth of normal pharyngeal flora. Most laboratories inoculate throat swabs on 5% sheep blood agar containing trimethoprim-sulfamethoxazole. A bacitracin disk that contains 0.04U of bacitracin is also placed at the initial inoculation of the swab. After overnight incubation at a temperature of 35-37°C, beta-hemolytic colonies that grow despite inhibition of the antibiotic disk are presumed to be composed of GAS. Cultures that are negative for GAS after 24 hours are held for another overnight incubation and reexamined. Elevated streptococcal antibody titers in the setting of hypocomplementemic nephritis are essentially diagnostic of PSGN. When the diagnosis of streptococcal pharyngitis seems particularly likely based on examination findings or when social factors necessitate an immediate decision about antibiotic therapy, the use of rapid antigen detection tests capable within minutes of identifying GAS directly from the throat swab is a reasonable option in most practice settings. Most kits use antibodies for the detection of group A carbohydrate antigen. The indicator systems used are latex agglutination or enzyme immunoassay. Tests can be completed in a matter of minutes. Numerous studies have demonstrated that the currently available rapid streptococcal tests have a sensitivity of 70-90% compared with standard throat cultures. In contrast to their relatively low sensitivity, the specificity of these rapid tests has consistently been 90-100%. Therefore, if a rapid streptococcal test result is positive, a culture is not necessary, and appropriate antibiotic therapy can be immediately initiated. However, when a negative rapid test result is encountered, a standard throat culture should always be obtained. In general, make decisions about laboratory testing and antibiotic therapy only after careful consideration of epidemiologic factors and clinical findings. Various clinical scoring systems have been devised to attempt to predict the results of subsequent throat cultures or antigen detection tests. At best, however, these scoring systems have no more than an 80% predictive value. Therefore, even the most experienced clinician should rely on bacteriologic confirmation of the diagnosis. Some clinicians express a reluctance to obtain diagnostic studies in children with sore throats, rationalizing this approach with the mistaken assumption that all febrile respiratory tract ailments require a course of antibiotic therapy. The ongoing crisis in antibiotic resistance and the urgent need to use a more judicious approach in antimicrobial prescribing practice should, it is hoped, herald a return to appropriate diagnostic testing for group A streptococcal pharyngitis. The appropriate bacteriologic confirmation of the tentative diagnosis of streptococcal pharyngitis is disputed. Fifteen years after their introduction into clinical practice, controversy persists regarding the relative merits of antigen detection systems for S pyogenes compared with traditional throat culture. Despite technologic improvements in rapid streptococcal testing, the throat culture remains the criterion standard for the diagnosis of streptococcal pharyngitis. If performed correctly, a throat swab cultured on a blood agar plate has a sensitivity rate of 90-95% in detecting the presence of S pyogenes in the pharynx. This sensitivity depends on properly obtaining the specimen. When possible, a specimen should be obtained from the surface of both tonsils and from the posterior pharyngeal wall. Other areas of the oropharynx are not acceptable; in the uncooperative child, study of a culture that was obtained from areas of the mouth that are clearly known to be inadequate for culturing is difficult to justify. The culture should be examined at 24 hours postinoculation and again at 48 hours postinoculation. Although a negative throat culture finding essentially rules out the diagnosis of streptococcal pharyngitis, a positive culture finding unfortunately cannot be used to differentiate between acute infection and asymptomatic carriage. Some studies have reported that the degree of positivity of the culture may, by quantifying the load of organisms, assist in making this differentiation. 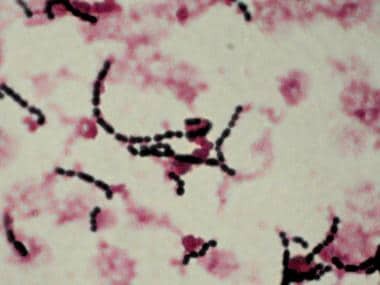 In practice, however, assuming that all positive results in appropriately cultured patients represent streptococcal infection and accepting that some degree of overtreatment is inevitable is probably best. The video below demonstrates a throat culture. When considering the approach to bacteriologic diagnosis, emphasizing those patients who should not undergo throat culture is important. Cultures should not be obtained from children with nasal congestion, injected conjunctiva, and cough, because these features indicate the presence of acute viral pharyngitis. A positive culture finding in this context only reflects chronic colonization (streptococcal carrier state). Although identifying and treating the streptococcal carrier may occasionally have merit, routinely obtaining cultures in children with symptoms suggestive of viral pharyngitis is not warranted and leads to unwarranted courses of antibiotic therapy. ARF is largely a clinical diagnosis that is best established by careful physical examination. Few patients with ARF have positive throat culture or rapid streptococcal antigen test findings at the time of presentation. Because the isolation and identification of GAS from a throat swab does not distinguish between a person with acute streptococcal infection and a person who is a streptococcal carrier, the best evidence of an antecedent streptococcal infection is a serologic response to the organism. An elevated streptococcal antibody titer can be used as serologic evidence of a recent GAS infection. Serial samples should be obtained because identification of a rising titer is particularly helpful. The most commonly used streptococcal antibody test is the ASO titer, although anti-DNase B and antihyaluronidase assays, which can be measured as a part of a panel of streptococcal antibodies (referred to as the streptozyme panel), are also helpful. When 2 or more different streptococcal antibody tests are performed, an increased titer is found within the first few months of onset in most instances of ARF. Computed tomography (CT) scanning and magnetic resonance imaging (MRI) are helpful in the diagnosis of cellulitis, myositis, abscess, and necrotizing fasciitis. Chest radiography and CT scanning of the thorax can aid in the diagnosis of pneumonia. Possible imaging studies include plain radiography, CT scanning, ultrasonography, echocardiography, and radioisotope renal scanning. For CNS manifestations, such as chorea and PANDAS syndrome, modalities such as MRI or positron emission tomography (PET)/single-photon emission CT (PET/SPECT) scanning may be valuable. As noted earlier, histologic analysis of skin biopsies may be an important tool in the diagnosis of streptococcal necrotizing fasciitis. In this setting, one of the hallmarks of the histologic findings is the absence of inflammatory cells, which suggests the necrotic, avascular nature of the affected tissue.